Smooth, silky skin is your best fashion accessory and beautiful skin never goes out of style. It’s time for luxurious salon quality hair removal products for all hair types. Smooth silky skin is your best fashion accessory and beautiful skin never goes out of style. Maintain your beauty with Hot Legs. Salon Quality. Easy to apply. Effective on all hair types. Affordable. The original microwavable warm wax formulation. Hot Legs Warm Wax has an excellent grip and leaves a clean finish with no sticky residue. 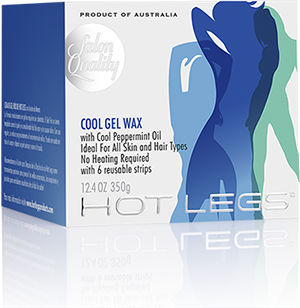 Water soluble and made from the purest Australian ingredients, Hot Legs Warm Wax contains natural AHA’s to revitalise the skin - leaving it smooth, soft and silky. Original microwavable formulation that is soluble in water. Salon quality formulation for full body waxing. Ideal for those who are regular waxers – normal to coarse hair. Comes with 6 professional strips. Additional Strips sold separately for full body waxing. Residual washes off with water. Doesn’t require any heating and has a unique formulation containing peppermint oil and antiseptic properties to soothe and refresh. Ideal for first time users. With our exclusive Resinique. Salon Quality formulation. Painless hair removal. Cool gel that grips hair, not skin. Effectively removes unwanted hair from any area of body. 8 strips (4 double sided). Pre waxed strips are the convenient no mess, no fuss method of hair removal containing a salon strength formula to remove even the most stubborn and coarse hairs. Will not crystalize in heat. Ideal for touch ups or when travelling. Ideal for full body waxing. 16 strips (8 double sided). A true salon quality formulation. Contains almond oil and is gentle on the skin replenishes moisture and reduces redness. Simply heat the wax in the microwave and apply to the body, wait a few seconds, then remove with your fingertips. Use as a cool gel applied directly onto skin or heat if preferred. Infused with peppermint oil to cool the skin to minimize discomfort with treatment. Contains six (6) professional polyastro strips that are designed specifically for this product. Provides sensational grip on the shortest hair. Reduces hair growth for up to six weeks with regular use. A depilatory cream that you can apply all over body and wash off to remove unwanted hair. Effective on all hair types, including coarse hair. No odor and gentle on the skin. Voted No. 1 depilatory by beauty editors. Mild, gentle formulation for total body use. Voted best hair removal cream formulation. An extremely effective post wax oil that soothes, cleanses and nourishes the skin. Containing all natural Thursday Island Plantation Tea Tree Oil from Australia. After Waxing Oil removes wax residue, prevents ingrown hairs and removes bacteria that is prone to causing pimples and pustules. Our signature product for the best salon quality results you have ever experienced! Contains Australia’s famous Thursday Island Tea Tree Oil. A natural antiseptic that with or other pure ingredients, eliminates bacteria from open pores after waxing, closes pores and nourishes the skin to give you that ultimate silky smooth result. Considered o the best after waxing product available for both professional and home use. 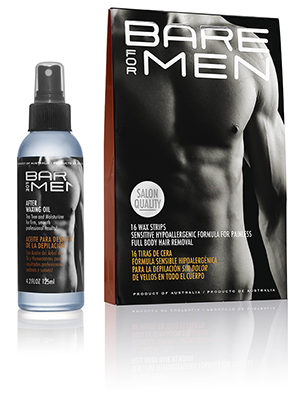 Bare for Men is the first hypoallergenic wax strip to market Designed for men for all body use. Ideal for full body waxing or touch ups. Bare For Men Wax Strips are formulated for men to grip the hair, not the skin for painless hair removal. This gentle, but effective sensitive formulation was developed by busy men who are conscious of maintaining their natural, well groomed appearance. Heat Resistant and suitable for treating any part of the body, Bare For Men is ideal for full body waxing or touch ups. Formulated with Thursday Island Tea Tree Oil ad other Australian botanicals. Bare for Men is suitable for all skin types to leave skin silky smooth, deter ingrown hairs and pimples.